1. Combine flour, baking powder, soda, salt, cinnamon & sugar in a large bowl. 2. In a small bowl beat together milk, egg, vanilla & oil. 3. Add wet ingredients to dry ingredients and stir until just incorporated. Do NOT over mix! 4. 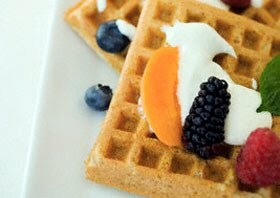 Cook in a waffle iron and serve with fresh fruit.